Kim Kardashian is a socialite, model, actress, businesswoman, and television personality. Toby Keith is a country music singer, songwriter, record producer and actor from Oklahoma. Kenny G, is a alto jazz saxophonist from Washington. He is one of the most prominent instrumental musicians of the modern era, having sold more than 75 million albums. Alicia Keys is a Grammy Award-winning singer, songwriter, musician, recording artist and actress. Her real name is Alicia Augello Cook. B.B. King is a famous and respected blues singer, song-writer and guitarist. Rolling Stone magazine ranked him as the #3 greatest guitar players of all time. 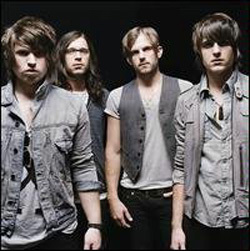 Kings of Leon is a rock band from Tennessee. The Kings are a family affair, all band member being brothers or cousins. Mark Knopfler is a British guitarist, a singer, a songwriter, a record producer and a film score composer. Knopfler is one of the most respected fingerstyle guitarists of the modern rock era. Jo Koy is a Filipino-American stand-up comedian, and actor from Tokoma, Washington. On stage, Koy mixes a lively physical presence with energetic, sharp observational humor, and inspirational-family-based laughs. Dave Koz is a saxophonist from California. You can also hear Dave Koz on radio. The Dave Koz Radio Show, is a worldwide syndicated, 2-hour weekend radio show that features Dave as host interviewing top artists and playing his favorite music. Kozac is a popular comedian and magician. Paul Kozac bills himself as the Host and MC of the "Worlds Greatest Magic Show." Diana Krall is an award winning pianist and singer from Canada. Krall's most recent album is mix of ballads and Brazilian bossa nova recordings. Lenny Kravitz is a singer, a songwriter, and multi-instrument musician. In addition to singing lead and backing vocals, Kravitz often plays all of the guitar, bass, drums, keyboards, and percussion himself when recording.